“This article omits the concomitant benefits of biochars for soil Carbon sequestration, building soil biodiversity & nitrogen efficiency, in situ remediation of toxic agents, and how modern thermal conversion systems are closed-loop, no significant emissions with a 1/3 carbon negative energy cycle, to focus on Biochar as a feed supplement cutting the Carbon Hoof, Paw, Fin and Poultry foot prints of livestock. that’s about 9 animals per person per year globally. Add to this another 600 million pets and mankind husbands a total of 2.5 Billion animals. climate costs by 1/3, or more, with such a small diet modification can not be ignored! Japan Biochar Association’s work rejuvenating sick, assumed dead, battery raised chickens. The char-fed eggs had no odor and fetched twice the market price in Japan. California. His work with “Carbon Fodder” in animal husbandry is unsurpassed, demonstrating efficacy to the Swiss authorities and leading to Switzerland becoming the second nation after Japan (in 1984) to officially recognize Biochar in 2013. Schmidt has helped several EU companies develop Carbon based dog, cat & cattle foods. He has pioneered integrated farm systems producing a continuous cascade of value enhancements. These include health gains and methane reductions from Char-based feeds, the reduction of GHG emissions, and the plant-available conservation of Nitrogen with Char and compost field applications. At Delinat a “Building Division” is being developed to exploit Char use as a building material in bricks, wood siding finishes, and Char-Plasters for solid state humidity control. If high temperature Char is used…hold on to your hats!…..All cellphone signals are blocked! “The use of biochar in livestock farming offers solutions to the increasingly complex problems of modern-day farming, the result of a combination of profit maximisation and disrespect for the physiological needs of the animals. 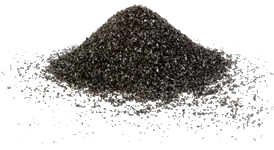 The adsorption qualities of biochar permit a wide range of toxic substances to be bound in the gastrointestinal tract. They also lead to the detoxification of already resorbed toxins (in particular lipophilic toxins) in the plasma via “enteral dialysis”. The oxidation and deamination of biogenic amines also play a particularly stabilising role in the intestines. Dysbiosis can be very efficiently and positively influenced by biochar, and eubiosis can be maintained much longer despite environmental fluctuations in the digestive tract.